French doors bring out the true personality of your home. A popular option for separating interior rooms, and, when used properly, they can completely change the character of any space. They provide separation while still maintaining a sense of open space. With proper accents, they can also provide an elegant focal point. 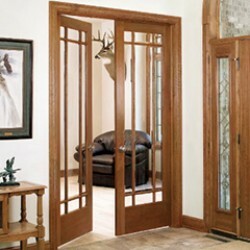 Interior French doors work especially well in kitchens, dining areas, master bedrooms, and entertainment areas. Adelaide French DoorShown in Patina..
Artisan French DoorShown in Patina..
Beveled French DoorShown in Patina..
Delta French DoorShown in Patina..
Diffused White Laminate French DoorShown in Patina..